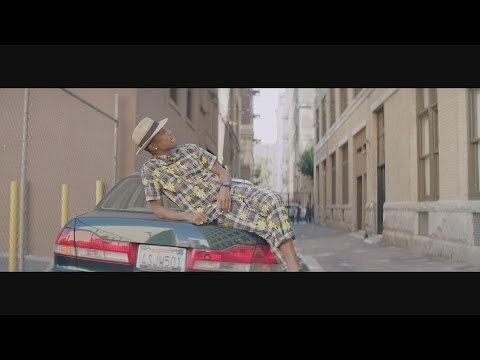 The song “Happy” by Pharrell Williams has sold in the millions and racked up hundreds of millions of views on YouTube. It features a unique chord progression that mixes major and minor tonalities and borrows chords from two different scales. If you’re interested in knowing how the music breaks down from a theory perspective, and you want to know what scales to play over the chord changes, then read on (and clap along if you feel like that’s what you wanna do). The song’s introduction begins with an F7 chord, creating a major key, specifically, F Mixolydian mode because of the b7th in the chord. But in just the fourth measure the tonality changes to minor with the notes F, Ab, Bb, and C. The official score indicates these pitches as chords, but I’m not hearing them that way. Instead, I hear them as a riff in F minor pentatonic, a scale that you can use to riff and jam over this section of the song. The chorus introduces some jazzy changes that are rich in harmony. I hear the chords as Dbmaj7-Cm7-F7sus4-F7. I consider this progression to be an example of modal interchange. The Dbmaj7 and Cm7 are drawn from the F minor scale (Aeolian mode), and the F7sus4 and F7 are drawn from the parallel scale of F Mixolydian mode, which is actually drawn from the C major scale. You can follow the chorus chords with their parent major scales by using Ab major scale patterns over Dbmaj7 and Cm7, and C major scale patterns over F7sus4 and F7. In each case your focus is the F note, so in essence you’re producing the sound of F natural minor and F Mixolydian mode. As you play along with the song’s chorus, play the chords Db-Eb-F using different chord shapes. For example, start with your index finger on Db at the 4th fret of the 5th string and play a common “A form” barre chord, moving up two frets for each chord change (you’ll play Eb at the 6th fret and then F at the 8th fret). Instead of playing the whole barre chord shape, try using just a portion of it like the first three strings. Then try other chord voicings and inversions, like portions of “E form” barre chords beginning at the 9th fret of the 6th string and ending at the 13th. Instead of using the shapes above as chords, play them as arpeggio patterns as I teach in the first volume of Fretboard Theory Chapter 3, and create lead lines that outline the chord changes. For example, put your pinky at the 4th fret of the 5th string and play up a “C form” arpeggio pattern, then repeat the arpeggio two frets higher for the Eb, and two frets higher again for the F.
Finally, you can use F minor pentatonic as a base scale and then target chord tones within it by mapping out arpeggio patterns in and around the pentatonic box as I teach in Fretboard Theory Volume II Chapter 8. As you can see, this happy, pop ditty is not only great for kiddos, silly dancers and lovers of Top 40, but also for guitarists that want to branch out from ordinary rock chord progressions to something jazzier that is richer in harmony. No wonder this song “struck a chord” with me right from the first time hearing it! Totally agree with the clever complex harmonies in the chorus that applies to the chords you suggested. Thanks Mate! This is great. My kids love this song. I’ll definitely have to start playing it for them now that I’ve read this post. Thanks for sharing.